A ready to use mix of all the essential Chinese ingredients and spices needed to make the perfect Chinese noodles or Fried rice. What's in our Chinese Noodles/Fried Rice ? 1) Simply add 200g Noodles and 2 cups vegetables. 2) Restaurant Like Taste at Home 3) No added preservaties 4) Made in three simple steps 5) Goes well with: Knorr Chinese Manchurian 6) Make it a meal with Knorr Sweet Corn Veg Soup 7) Serves 4 8) Chef's Tip: Add this mix to any Asian recipe for a tasty noodle or fried rice. 1. Stir-fry 2 cups of finely cut (julienned) vegetables like cabbage, capsicum / green pepper, carrots and spring onions in a wok until cooked, but still crisp 2. 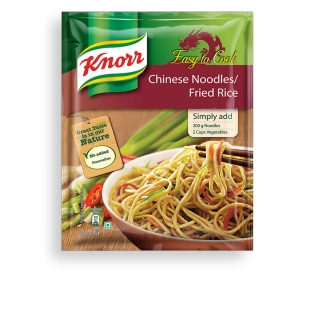 In a separate bowl, mix contents of Knorr® Easy to Cook Chinese Noodles/Fried Rice with ¼ cup water to make a sauce. Pour into the wok and stir. 3. Add 200gms of boiled noodles to the wok and mix well until coated with sauce.